i am so excited to have this book in my hands. i think you all know from seeing my desktop so often that stephanie’s first book is a constant companion of mine. i love to open it randomly to read a “purl” of wisdom, humility, or laughter; it’s a real treasure. so when i read on her blog that the new book was in a similar format (tiny lessons and essays), i got pretty excited. i’d had my copy on pre-order since last october or so, and now i knew what it might be like. then i got the email from overstock saying it was on the way. and now it’s here . . . and it’s wonderful (it’s only been in the house an hour, so no, i haven’t read the whole thing yet, but i’m already sure it’s fun). AND—it’s in hardcover (i am so going back over there right now to order a bunch of them for gifts). (ooops, they are sold out—i swear it was not me.). thank you stephanie, and many congratulations. i hope i get to see you during this tour. I love all of her books! This one is sold out on Overstock. Oh, YOU ordered them all!! I know you said you didn’t, but you know what happens when you post anything! HAHAHAA! I love that first book of hers also and was delighted to hear this new one was in the same format, cannot wait to get a copy! I know I feel the same way about stephanies first book Meditations… When I read it the first time I laughed, I cried, etc… I was so excited to see this up for release that I ordered a copy too! I hope it comes in the mail today. I bought the book today too! I haven’t had a chance to look at it yet but I can’t wait! The lady at the bookstore looked at me like I was maybe a few marbles short of a bag when I expressed my–let’s call it “surprise”–that they hadn’t gotten it in yet. 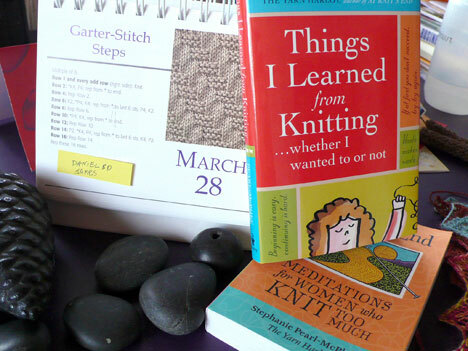 She seemed not to understand that a book about knitting could be a matter of some urgency. I resisted the urge to pull my sock needles out of my purse and give her a good jab when she told me it would be in “soon”. I’m looking forward to picking up a copy of her new book soon. Provided my local bookstore has it, I should have a copy of my very own by this coming Friday! 😀 I have all her other books, and have enjoyed them all.